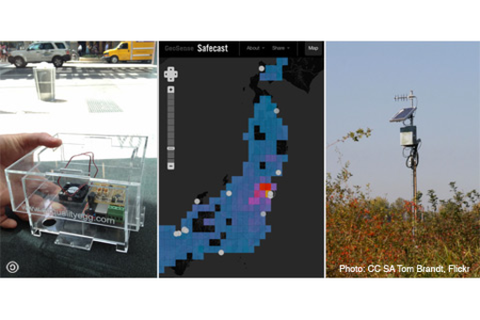 What Do Sensors Mean for News, Society & Science? Every day, sensors around the world record more data. Increasingly, citizens are becoming sensors, carrying mobile devices that enable them to collect and share observations from their environments. From governments to universities to utility companies to the media, organizations are tapping into the wealth of data generated by mobile phones and sensor networks. They're using that data to understand and sometimes solve scientific and civic problems, creating beneficial feedback loops between policy and outcomes. This emerging ‘Internet of Things’ holds profound implications for the future of news, civic engagement, science, and business. Media will have new sources for reporting. Civic activists will have new means to hold government accountable in networked environments. Governments will find new ways to engage with constituents, fill in existing data gaps, and understand whether their policies are working. Startups will emerge to produce new devices and information services. Alexander B. Howard is the Government 2.0 Washington Correspondent for O'Reilly Media, where he writes about the intersection of government, the Internet and society, including how technology is being used to help citizens, cities, and national governments solve large-scale problems. He is an authority on the use of collaborative technology in enterprises, social media and digital journalism. He has written and reported extensively on open innovation, open data, open source software and open government technology. He has contributed to the National Journal, Forbes, the Huffington Post, Govfresh, ReadWriteWeb, Mashable, CBS News' What's Trending, Govloop, Governing People, the Association for Computer Manufacturing and the Atlantic, amongst others. Prior to joining O’Reilly, Mr. Howard was the associate editor of SearchCompliance.com and WhatIs.com at TechTarget, where he wrote about how the laws and regulations that affect information technology are changing, spanning the issues of online identity, data protection, risk management, electronic privacy and cybersecurity. He is a graduate of Colby College in Waterville, Maine. Javaun Moradi is a Product Manager at NPR Digital Media in Washington, D.C. Javaun oversees NPR’s API strategy and is one of the inventors of the Infinite Player, an experiment in continuous, personalized listening. He has been a catalyst in many other digital experiments and was also a frequent lecturer to the NPR newsroom during an 18 month training program to shift NPR to a digital-first mindset. Javaun has also advised editors and news staff at NPR stations, the Washington Post, the CBC, and the Center for American Progress. Prior to NPR, Javaun's career spanned companies such as IBM, Move.com, WebMD, and Beazer Homes. Javaun is an often sleep-deprived, but always enthusiastic, parent of a toddler. He loves mountain biking, and someday he'll have the time to do it again.